SOUL FOOD for Young Adult Communities: Nov.24th 2013, Feast of Christ the King. Today, we celebrate the final Sunday of the Church’s Year, Feast of “Our Lord Jesus Christ, King of the Universe”. The Gospel is from Luke 23: 36-43. Find it in your Bible, or click here for Mass Readings for this Sunday. Greetings to the young men and women, Leaving Cert Students from St. Brendan’s Community School in Birr, Co. Offaly, who were with us on retreat during this past week! Thanks for being here, you were a real joy to be with. Sometimes in life, we are caught by surprise when we find things turned upside down, or back-to-front,- when we are, literally, caught by surprise. We don’t expect the unexpected! A very young person, a child maybe, turns out to be very wise. A shy person we know turns out to have a wonderful smile. And someone we thought didn’t deserve a second look, suddenly captivates you by who they really are, or by something wonderful they do. The way we thought about that person isn’t in fact the real person at all. Jesus surprises people all the time. was in the last hour or so before death, he saw the man in the middle, and the sign that was nailed above his head, detailing his ‘crime’ for which he was being put to death. It was written in Hebrew, Greek and Latin, for all passers-by to read. 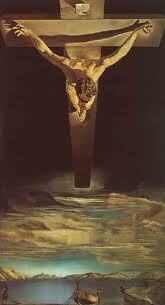 It read, in Latin, ‘IESUS NAZARENUS, REX IUDEORUM’, or ‘Jesus of Nazareth, King of the Jews’. (We see it on our crucifix with just the first letters I.N.R.I.) Then he saw the ‘crown’ on this king’s head,- thorns twisted together into a crown of mockery. And, for all his suffering, this ‘king’ was calm. We’re told by Luke that ‘the people stayed there, watching Jesus’. 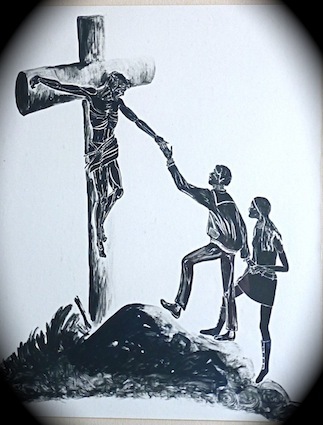 One criminal began to mock Jesus, telling him to get them all down from their crosses. The other one, however, rebuked him, and then turned to this ‘king’ beside him and simply said ‘ Jesus, remember me when you come into your Kingdom.’ He was the only one in the whole place to call him by his first name, ‘Jesus’ (it means ‘saviour’). The ‘king’ beside him, – and he really was and is ‘king’ of people’s hearts- turned and answered him: ‘this day, you will be with me in paradise’. The thief had stolen heaven by simply turning to Jesus, the saviour-king. 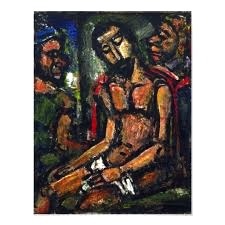 A famous French painter, George Rouault, often painted Jesus looking like a clown. This ‘king’ with a very strange ‘crown’ might look like a clown to many, but his whole life and love (‘greater love than this no-one has…’) tells us the deepest truth of all,- how immensely loved each one of us is by the One who has come to save us and set us free. No hopers? Not any more! We sure have some ‘king’! Click here to read ‘A CLOWN IS CROWNED’ in www.emptifulvessels.com. ← Death of Fr. Alec Reid, Redemptorist, Peace-Maker.